Which Are The Best Layout Blinds For Waterfowl Hunting in 2016? Hunting can be a very complicated proposition. There’s the necessity of having to go out in the elements, and the outdoors don’t usually have modern amenities like cushions to make you feel comfortable. Then there’s the problem that the animals you like to hunt often have better senses of smell and sight than you, and being unnoticed is a challenge that’s not always met successfully. If your style of hunting is laying yourself down and waiting for your prey to come into your line of sight, then you may want to think about using a layout blind. Layout blinds are a prepared area that allows you a place to lie in wait while remaining unnoticed. These blinds come in all shapes and sizes: some are like mini tents, others are more like sleeping bags, but they are all camouflaged and meant to keep you as hidden as possible. In the old days, you had to make this yourself, and it wasn’t easy. You had to build the framework for your “mini-camp”, cut foliage to blend in the area, secure the foliage to the frame, and secure the blind to your chosen spot. You did all this because the benefits of a layout blind are immense. You have a place where you’re hidden from alert eyes, and it also enables you to move around without startling your quarry. It even covers up your scent and protects you from the cold wind with comfort. Nowadays, you don’t have to build your own layout blind from scratch. Now you can just buy one instead, and the best options in the market offer tremendous advantages. With a good duck hunting blind, decoys and duck caller you will be a formidable force. Let’s start by saying, we love this layout blind and think you will too. I loved it from the moment I laid down inside. It is truly the most comfortable hunting blind I’ve ever tried. The zero-gravity design allows you to smoothly get up and down by leaning back or forward while keeping your body off of the ground. One of the other things I really liked about it was the natural look of the design. 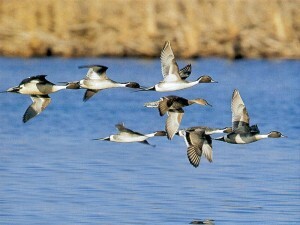 Most waterfowl hunting blinds have sharp corners that aren’t something you would see in nature. The Delta blind has sides that flare out from the side giving it a more realistic look to your prey. 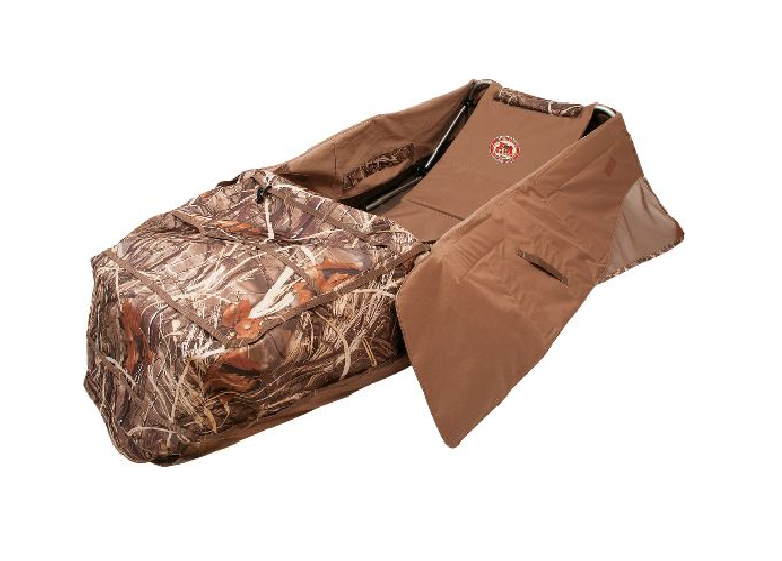 These sides also give you an extra space to hide your decoy bag or other gear. Setting it up is super quick and easy because no assembly is required at all. Cleanup is a snap since there is no floor on this model. Transporting is very easy as well. 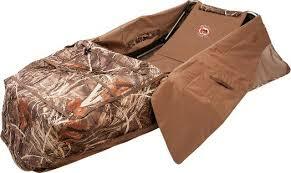 It is light and comes with built-in shoulder straps so you can pack it in to your favorite hunting spot. This is the best layout blind on the market today. Easy to set up, lightweight, super comfortable and excellent concealment. You really can’t ask for more in a blind. This one is worth every penny. Final Approach layout blinds are quite light at 12 pounds, and it is compact as well in the backpack mode so you can just carry it with you when you’re in the woods. If you’re always changing your location when you’re hunting, travelling in backpack mode is a good option. It’s easy to set up and store whenever you want. One negative I found was that the instructions aren’t very clear. I needed to practice setting it up and packing it away and took me a few times to get the hang of it. Once you figure it out though the set-up is easy and you won’t have any trouble with it after that. Once you’ve set it up, you’ll find that your profile is going to be very low to the ground, concealing your presence. It measures 26″ W x 84″ L x 14″ H. It holds up more than 200 rag decoys and up to 4 dozen silhouettes. The built-in scabbard holds your shotgun and flags to leave your hands free. The closed-cell foam protects you from the cold and wet from head to toe, and the gun rest and the head rest are padded for comfort. The double lid system offers a rapid shooting access. Overall this is a nice blind and did the job as I bagged numerous birds on my first test. => Click here to see pricing and availability of the Final Approach X2 layout blind. The Eliminator Express is another blind from Final approach, and like its X-2 cousin it’s quite light at 11.5 pounds. 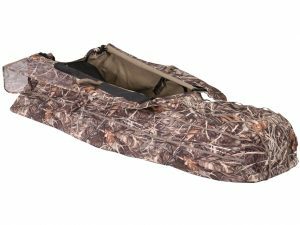 In its collapsed backpack form it measures 32″ W x 24″ L, and when you’ve set it up it measures 25″ W x 78″ L x 14″ H. It’s roomy enough inside that some hunters can even fit their young child beside them when they’re out hunting. But some of the bigger dads may not find this possible. Final Approach uses a rust-free aluminum for the frame, and 600-denier Advantage Max 4 camouflage upper with a PVC waterproof backing. For ground cover, it uses a 1,200-denier waterproof floor. You also get a fold-down gun rest along with stubble straps for extra concealment and a double flap opening. For the amount of money you pay for this layout blind you get some really good value for your money. The Eliminator Express Blind build quality is quite high, without paying a high price. It is also very durable. We have a number of these blinds we use on our trips. We’ve had them for two years now and they haven’t yet seen a tear or a rip. Also, with its light weight, it’s not a problem to bring it with you when you hunt in remote locations. This is another very nice choice if you are looking for a new waterfowl hunting blind. => Click here to see pricing and availability for the Final Approach Eliminator layout blind. 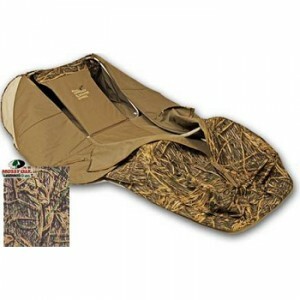 The Ameristep Duck Commander Layout Blind is a bit heavier than the others, but not by much. It weighs 14 pounds when folded, and measures 47″ x 17″ x 8″. When you’ve set it up, it measures 86″ x 36″ x 20″. It’s quite durable, as it is made of durable 600D poly for the body. For the floor, it uses 1500D poly with a PVC layer for protection against water and the weather. 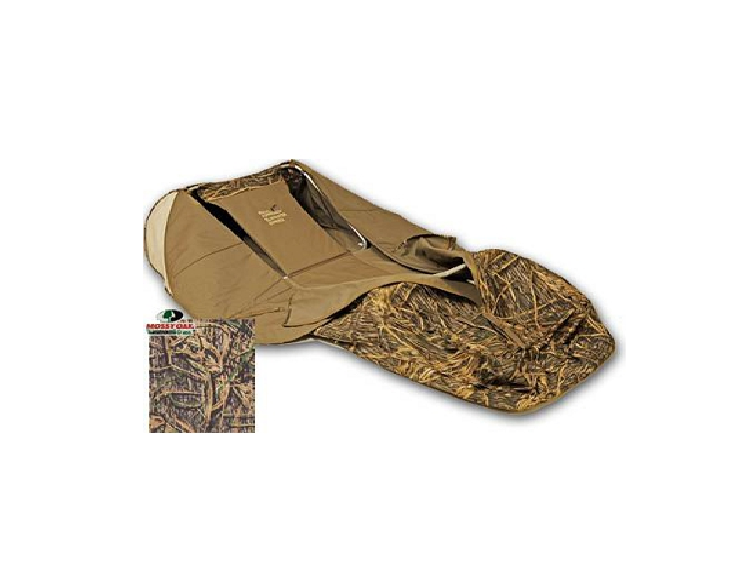 With the elastic-weave stubble straps, you can add some foliage for camouflage, while the light-colored field khaki material can blend with all types of hunting environment. Other features include quick release doors, a large screen, padding for your seat and head rest, zippered flagging ports and side ports, and a storage compartment for your ammo and flags. It only takes a few seconds to set up. The size is ample enough for large adults. I’m 6’1″ and have plenty of room when I’m inside. It can be used for all types of weather conditions, and it will hold up remarkably well. It’s been used in very cold conditions (such as 20 below) or in moderate heat (more than 60 degrees) and there were no problems to report. It will keep you dry in wet or muddy conditions, without stifling you. Some people don’t like the lack of camo design on the blind. Personally, I like it. The plain tan coloring actually blends in with more kinds of ground cover. You’ll just need to mix in the local vegetation with the blind and concealment is done. => Click here to see pricing and availability for the KillZone layout blind. Any of these three options is a winner, so choose one that fits your preferences and circumstances. Once you’ve bought one, practice setting it up at home, and even practice preparing for your shots. Hunting (or shooting pictures of wildlife) is hard enough without having to deal with figuring out how to set it up in the dark, or trying to find out how you’ll shoot your rifle or bow when your target appears. Happy hunting! 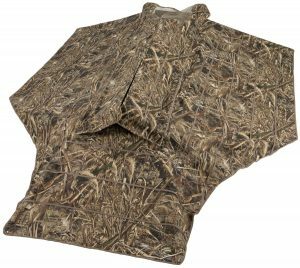 Previous story Camo Jackets – Which One is the Best For Duck Hunting?